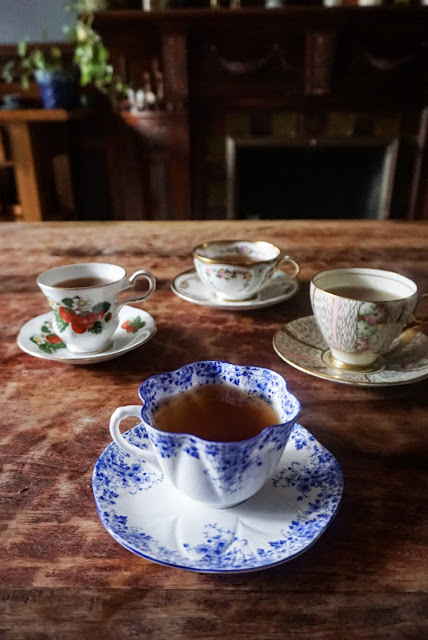 Tea Happiness- A blog on tea drinking, tea history, tea industry interviews, NYC tea experiences! 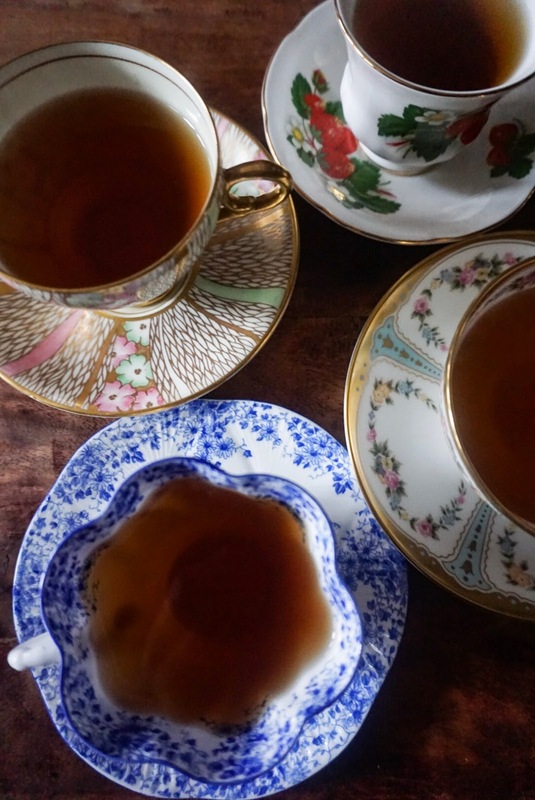 : Teaware History: What Is Bone China? Teaware History: What Is Bone China? Once cleaned, the bone is heated to about 1000 °C (1832 °F) so that all additional organic material is removed from the bone and the bone becomes sterilized. Lastly, the newly sterilized bone is ground with water into fine particles which can be used as a raw material for bone china. This all made me wonder, who decided to try adding bone ash to a clay mixture? In the early 18th century, European manufacturers desperately wanted to recreate the beautiful porcelain pieces imported from China, but had difficulty doing so. Before the discovery of hard paste porcelain in Germany, manufacturers were using all sorts of techniques to create a durable material. In the UK it was discovered that adding bone ash to soft-paste porcelain would strengthen the material during firing. English potter Josiah Spode is credited with perfecting the formula for bone china in the 1790s. From what I've read, the bone ash doesn't necessarily make the material stronger, but it does impart a creamier, white color that is difficult to otherwise achieve. The material is also quite thin and translucent. 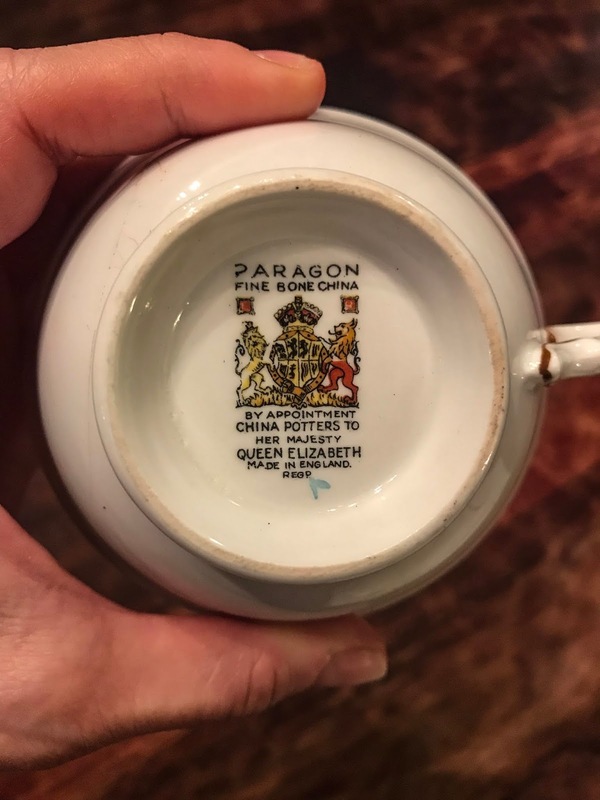 This delicate appearance was greatly sought after in teaware and other porcelain objects After the success of Spode, other English potters started developing formulas for bone china in the early 1800s. The Spode manufactory was the first to perfect a body using about 50% animal bone combined with the ingredients for true porcelain ie china stone and china clay. This is the formula which is now described as bone china. 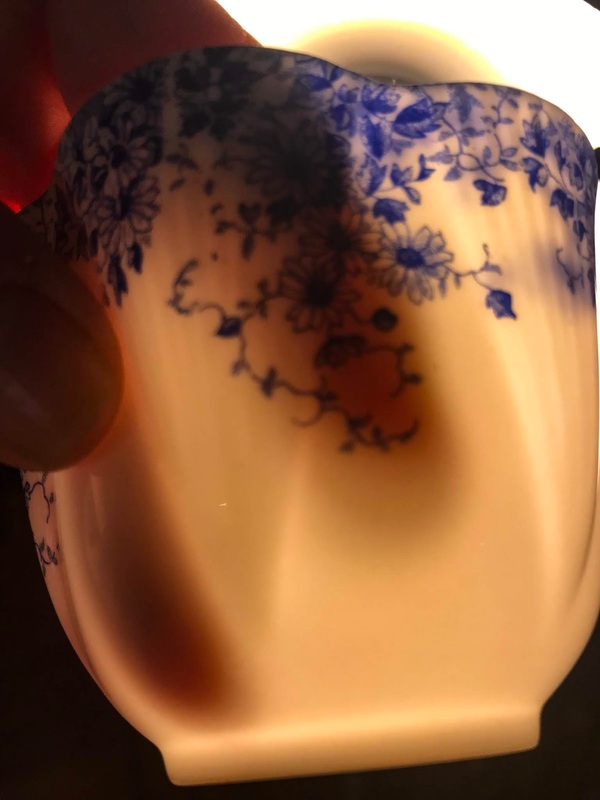 Bone china is translucent. See the silhouette of my fingers through this Shelley cup? Bone china is supposed to have a warm, creamy appearance, and the material is more translucent than regular porcelain clays. To be called 'bone' china the material should have at least 25% bone ash added, although it's tough to know how much was used. If you're wondering if you have a piece of bone china, hold it up to the light and put your hand behind it. Can you see it? If you can, it's likely bone china. As with other fine china pieces, if you give the edge of a piece a flick with your fingernail, it should have a nice ring to it. Although if it doesn't it may not mean it's not bone china, it could mean there is a crack in the piece. But if you get some experience handling fine and bone china pieces, you'll start to have an idea for the look and feel of it. The easiest way to check? Look at the backstamp, if there is one. Along with the maker, it should include the words 'Bone China', 'Fine Bone China', 'British Bone China', etc. Bone china is generally more expensive than other china, because of the bone ash. The labor is more intensive to create the material. Bone china is easy to find today in stores that sell teaware and dishware. I prefer to collect vintage pieces that I find online and at flea markets and antique stores. I also found this helpful book that will help you clearly identify your china. Bone china was originally manufactured in England, so many of the older pieces you find will be from the UK. If you're vegetarian or vegan, I'd be curious to know- would you knowingly purchase bone china?I am curious to know what you all think! Please leave a note in the comments. Ok, I have to share one last strange tidbit...so my research got a bit out of hand, and I came across china pieces you can have created with HUMAN bones, as a memorial. This is definitely bringing bone china to a new level.